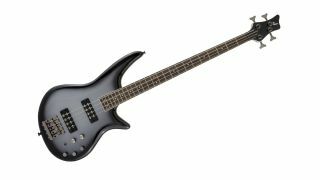 NAMM 2019: There are three models in the new Spectra Bass series, the JS2, JS3 and JS3V. Each model features a brand new offset poplar body shape with a large upper horn that evenly distributes weight throughout the guitar for more comfortable playing over longer hours. The four-string JS2 features a Jackson J-style bridge pickup and P-style neck pickup to deliver a range of punchy growls and lucid tones that can be tweaked and refined with blend, bass boost and volume controls (including a push/pull selector to bypass or engage the active circuit for the bass boost). Guitars are available in Gloss Black, Metallic Blue, Snow White or Tobacco Burst. The JS2 also features a bolt-on maple neck with scarf joint, 12” radius laurel fingerboard, Jackson hardtail bridge and a 2x2 Gumby headstock. JS2 basses are priced at £219. The 4-string JS3 (£300) and 5-string JS3V (£345) feature a bolt-on maple neck with graphite reinforcement and scarf joint and a 12”-16” compound radius laurel fingerboard. Dual passive Jackson medium-output humbucking pickups deliver a thunderous low-end, while a HiMass bridge provides rock-solid stability and improved sustain. Both models also feature a two-way toggle switch for pickup coil splitting, 3-band EQ (active only), blend control and volume control with push/pull selector to bypass or engage the active circuit for the 3-band EQ. The JS3 is available in Gloss Black, Metallic Red or Silverburst, while the JS3V is offered in Satin Black, Silverburst and Walnut Stain. Jackson’s X Series Concert basses have been treated to upgraded electronics, plus a host of new finish options to ensure they’re a force to be reckoned with both on stage and in the studio. At the core of these guitars is a Jackson J-style bridge pickup and Jackson P-style neck pickup, paired with an active 3-band EQ circuit for pouring on the punch, cut, rumble or grunt. A Jackson HiMass bridge enhances note attack and sustain without altering tone while the sealed die-cast tuning machines keep the strings in tune even, however hard you play. The four-string CBXNT IV (£480) is available in Matte Army Drab with a parchment pickguard and gold hardware. The guitar also features a poplar body, 34” scale, one-piece maple neck-through body and a 12"-16" compound radius bound laurel fingerboard with 24 jumbo frets for lightning-fast playability. The CBXNTM IV (£480) shares the same features but comes with a maple fingerboard and Butterscotch or Snow White finish with black pickguard and chrome hardware. As for five string Concert models, all feature a poplar body and one-piece maple neck-through body, with a slightly longer 35” scale. The CBXNT V (£529) is now available in Gloss Black with a white pickguard and chrome hardware, plus a laurel fingerboard with pearloid sharkfin inlays. The CBXNT V MAH (£529) features a mahogany top, laurel fingerboard with pearloid sharkfin inlays and comes available in a Natural finish with parchment pickguard and gold hardware. Finally, the CBXNTM V (£529) features a maple fingerboard with black sharkfin inlays and is available in Fiesta Red with a black pickguard and chrome hardware. Want to know more about Jackson’s new bass models? Visit the Jackson site for the latest info.